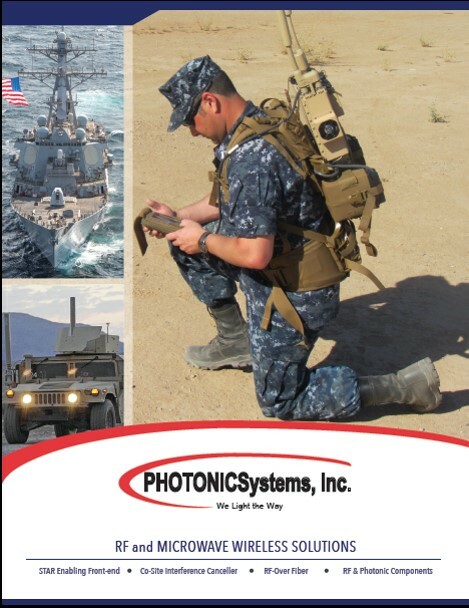 Photonic Systems Inc. (PSI) provides innovative RF and photonic solutions that enable new and improved wireless system performance and capabilities. PSI delivers what others say is impossible! Analog to digital converters (ADCs) provide the critical link between the RF analog front-end and the high speed digital signal processing function chain in a receiver. Unfortunately in high performance applications, the ADC is typically the weakest link in this chain; limiting the capabilities of the digital receiver. The photonically sampled electronically quantized (PSEQ) ADCs in development at PSI provides >10x improvement in ADC speed and resolution enabling new system capabilities and improved accuracy. More coming soon. From the development of the lowest Vpi optical modulators to extremely accurate laser diode and modulators bias control (MBC) circuits, PSI offers a variety of specialized devices and components for RF and photonic based systems. In addition to standard product offerings, PSI designs, develops, and manufactures a number of customer optical modulator and electronic control solutions. Learn more about PSI’s laser and modulator bias controllers and optical modulators. © 2016 PHOTONIC SYSTEMS, INC.